Russia reportedly withdrew approximately fifteen of its airframes from the Bassel al Assad International Airport in Latakia Province from March 15 - 16, following Russian President Vladimir Putin’s announcement of a drawdown on March 14. Five Russian Su-34 bombers, four Su-25s, five Su-24s, and at least one Su-30 had left the airbase to return to Russia as of March 16, according to a Reuters investigation of Russian state media. 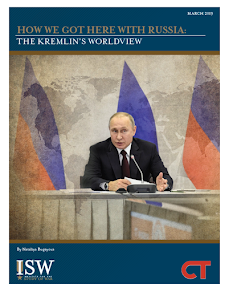 Russian officials asserted that Russia would nonetheless continue its counterterrorism efforts, a term Russia has previously used to obfuscate its air campaign in support of President Bashar al Assad against mainstream elements of the Syrian opposition. Russia has yet to withdraw many of its other aircraft from the base, including numerous short- and medium-range bombers. Putin has messaged his determination to defend both the airfield at Bassel al Assad and Russia’s naval basing in Tartous as well as his intent to retain the S-400 air defense system in Latakia. Russia has therefore gained significant capabilities along the Eastern Mediterranean that it intends to secure. Russia will therefore continue to be able to rapidly deploy long- and medium-range air assets into the theater through its airbase in Latakia. 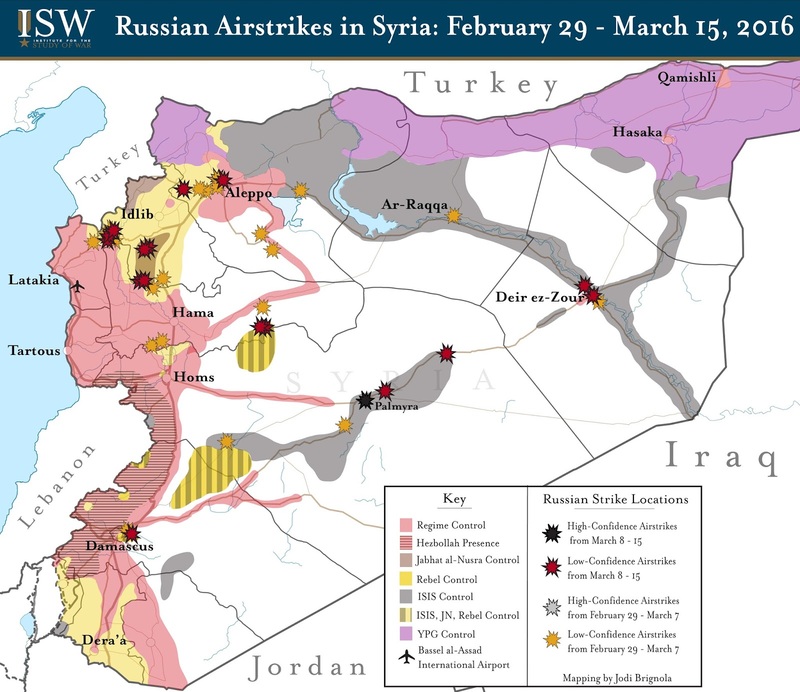 As Russia’s air campaign had operated at decreased levels since the cessation of hostilities agreement on February 27 and had lowered its rate of airstrikes even further from March 14 – 15, Russia may be removing excess airframes from the base. Russian airstrikes in Syria have notably decreased since Putin’s announcement and partial drawdown. ISW was only able to confirm strikes in the vicinity of the ISIS-held town of Palmyra in central Homs Province with both high and low confidence from March 14 - 15. Pro-regime forces launched a renewed campaign to seize Palmyra in early March, backed heavily by Russian and regime fixed and rotary wing strikes. Russia will likely continue its air operations in support of the regime ground offensive against Palmyra, despite the drawdown. The combination of Russian airpower and likely Iranian reinforcement has brought Assad’s forces within four kilometers of Palmyra as of March 16. 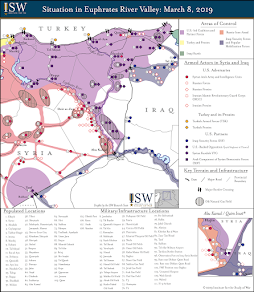 The current “cessation of hostilities,” which does not apply to ISIS targets and which has reduced overall levels of violence has likely allowed the regime to refocus efforts on clearing ISIS’s presence in central Homs. Russia will also use its air operations against ISIS as a means to further project itself as a provider of international security and to legitimize its continued presence inside Syria. Russia’s airstrikes against ISIS, however, come at a cost. Alleged videos and photos from Palmyra show the damage caused by the intensity of Russia’s air campaign in the area, while local sources continue to report civilian casualties, highlighting the continued indiscriminate nature of Russian airstrikes. The Russian air campaign and recovery of Palmyra may on the surface seem to support U.S. objectives against ISIS, but over the long term may exacerbate grievances and insurgency.